A couple of weeks ago, myself and Nicola took a trip through to Edinburgh to attend the Foodies Christmas Festival. With so many of our favourite restaurants located in the capital, we had no shortage of options when it came to our dinner plans later that day but when we were asked if we would like to review La Petite Mort, it only took the shortest of glances at the menu for us to happily accept this kind invitation. La Petite Mort is located near Edinburgh's Tollcross, next to The Kings Theatre. In years gone by, the restaurant was previously the theatre's 'Green Room' used by actors and their followers and now owned by the same husband and wife team who own Bennets Bar, one of Edinburgh's most historic bars, as well as Blue Blazer, Kikderkin and The Windsor. 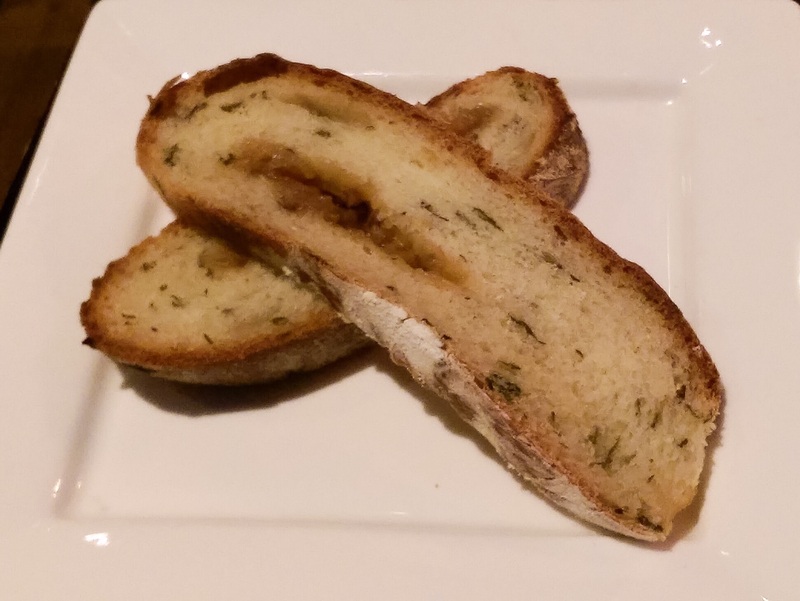 After a long day on our feet, punctuated with a few drinking stops along the way, we arrived at La Petite Mort a little early but we were quickly greeted and seated and left to look over the menu. 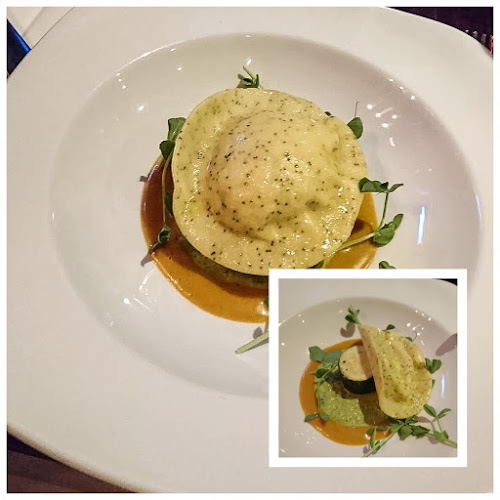 The restaurant is a fifteen minute walk from the main shopping area of Princes Street or just five minutes on one of the many Lothian Buses that go by the theatre. 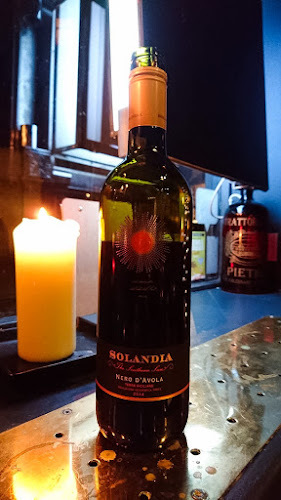 The wine list is fairly extensive with plenty of option to suit most budgets and knowing that we would both be ordering red meat for our main course, we opted for a bottle of the house red - a wonderful Solandia Nero D'Avola from Sicily. Restaurant manager Jennie explained that they try hard to keep the wine list interesting, stocking wines that you might not find elsewhere. As house wines go, the Nero D'Avalo was very good, deep red in colour and packed with plenty of berry fruit flavour and a hint of liquorice and vanilla in the background. If you like Shiraz, then you should enjoy the similarities that this Italian red brings to the table. One of my pet hates is when a restaurant serves up bread that is easily recognisable as something they have par-baked straight from the freezer. Thankfully this wasn't the case at La Petite Mort as the home baked sourdough with a caramelised onion middle was one of the best breads that we have had in a long time. In fact, I made sure to get a second helping before our starters arrived. To start, Nicola ordered the poppy seed ravioli of whisky smoked lobster, orange and marscapone which was served with roast courgette, lobster bisque mayonnaise and a fennel & spinach velouté. The ravioli was cooked well and presented on a giant piece of flavourless courgette, which must have been there for nothing more than to give the dish a little elevation. The ravioli was a good size and although there was a little lobster inside, there probably wasn't enough to make the starter sing. The lobster was cooked well but it was difficult to identify the smokiness from the whisky barrel as the orange flavour dominated the palate. Thankfully, the lobster bisque mayo was packed with flavour and was well balance by the aniseed flavours in the velouté. 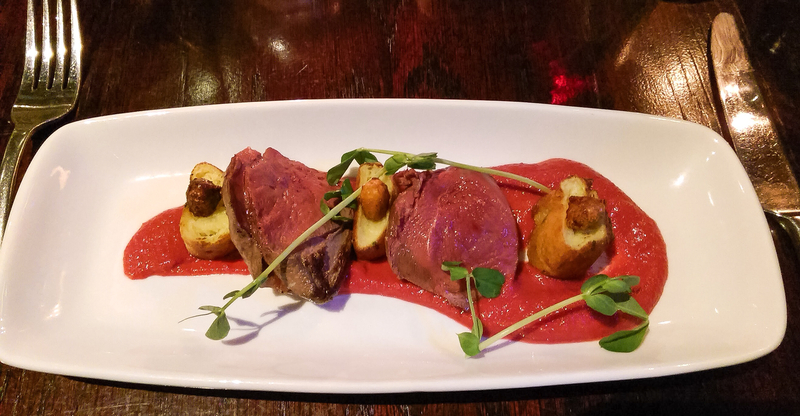 For my own starter, I chose the pan fried pigeon breast with truffled gnocchi, parsnip & beetroot purée and saffron roasted pistachio. Again, this was a starter that had some good points and some not so good. The pigeon was cooked perfectly, seared on the outside and pink in the middle. 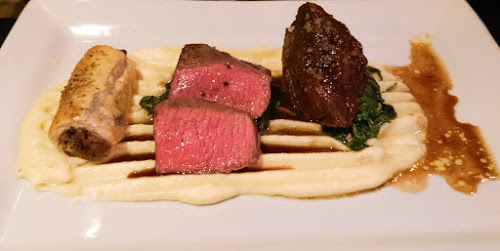 The rich gamey flavour of the pigeon was balanced by the earthy purée which was underseasoned. I struggled to identify the parsnip in the purée, the beetroot was overpowering but I do believe that a good grind of salt would have helped to pull the dish together. I experience food envy on a regular basis and tonight was no different. 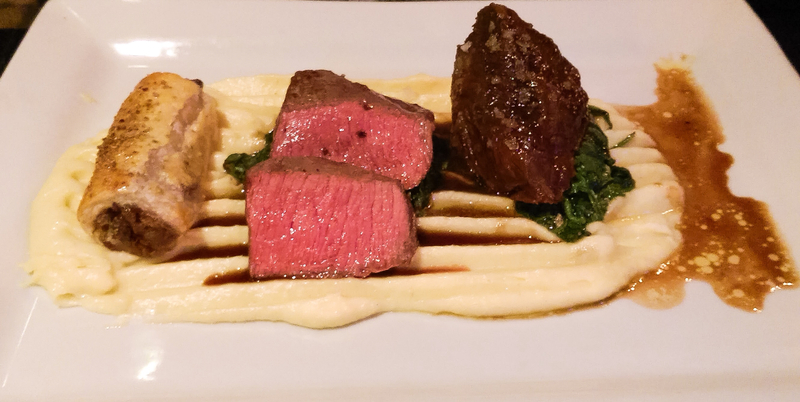 Nicola's main of a trio of beef including pan seared flat iron steak, braised ox cheek and oxtail sausage roll, with mousseline potato, buttered spinach and red wine jus was a lesson in clever home comfort cooking. The three examples of beef were a joy, from the perfectly cooked flat iron steak to the melt in the mouth rich ox cheek to the richest 'sausage' roll that we've ever tasted. I've never seen oxtail wrapped in pastry and presented as a sausage roll but I can't wait until the next time. As if this wasn't enough, the rich indulgent mashed potato was silky and buttery and oh so more-ish. The buttered spinach and sharp red wine jus did manage to bring a certain amount of balance to the dish.....but only just. If I was on death row and could chose my final meal, it might just be my own 'little death' treat. My own main was another hearty plate of well cooked food. 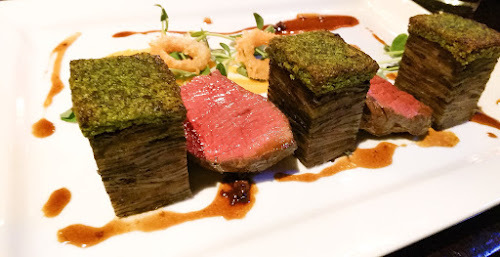 I had ordered the roast venison haunch, herb crusted black pudding dauphinois potatoes, butternut squash purée, tempura shallot rings and blackberry jus. I love venison but am always wary that it gets over cooked. No danger here as the venison was served on the right side of pink for my liking. The venison was joined on the plate by three skyscraper towers of black pudding dauphinois potato, a clever concoction of wafer thin potato cooked with crumbled spicy black pudding. The dauphinois was almost perfect, the potato cooked well and just enough spicy coming though to work with the gamey meat. The towers were topped with a herbed crust that didn't bring much to the plate and I wouldn't have noticed if they weren't there. The tempura shallot rings were delightful, and the blackberry jus was sharp enough to cut through the rich flavours. My only criticism was that I felt that the plate needed much more of the jus for the amount of potato on the plate. By this point we were both stuffed and despite the fact that there were a few desserts that had caught our eye earlier, we decided that the best way to finish our meal was with a shot of espresso before making our way out into the rainy Edinburgh evening. As I said at the beginning, Edinburgh has no shortage of good restaurants and I would happily add La Petite Mort to the list. Head Chef Neil Conner works with locally sourced produce to create a delicious menu that offers great value for money. We dined as guests of La Petite Mort but the review above is an honest account of our experiences. I would like to thanks the staff and management for their hospitality and generosity and I wouldn't hesitate in recommending La Petite Mort to friends or family - It wasn't perfect but with a few little tweaks, it could be. 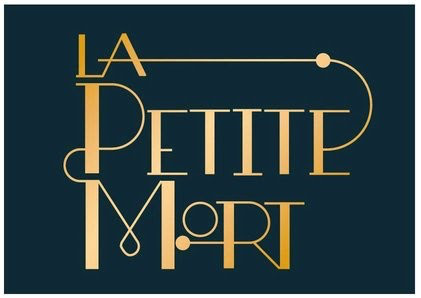 Keep up to date with news from La Petite Mort on Facebook and Twitter.